Hello friends! It was supposed to be easy for me to leave this old blog sitting right here to allow folks continued access to all of the files i've shared along the way, but Dropbox had to go and kill their public folder feature. Because of the changes they have made, many of the links to files I've shared are no longer functioning. This is inconvenient for me and for you. I am in the process of looking for and thinking through a good solution, but I'm also in the middle of my real-life busy season. This means that it might take me some time to get back to each and every post to correct the issues. For the mean time, I am aware of the issue, and I hope to get things all back in working order soon. 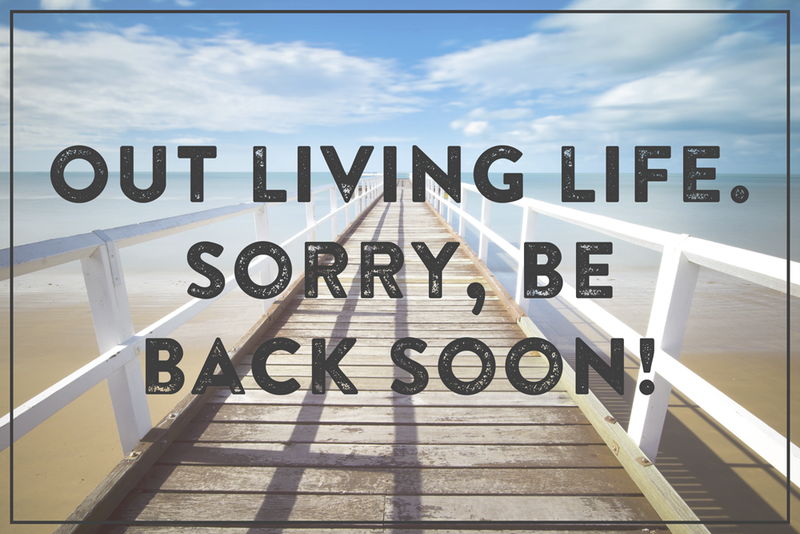 I apologize for the troubles! Ugh... Meal Planning is not one of my favorite topics. Thoughts of failure and inadequacy fill my mind whenever I begin to think about it. After almost 15 years of marriage I still struggle with it, but some tools and methods are finally helping me to do a better job. Trial and error have helped me to determine what works for me and my personality. 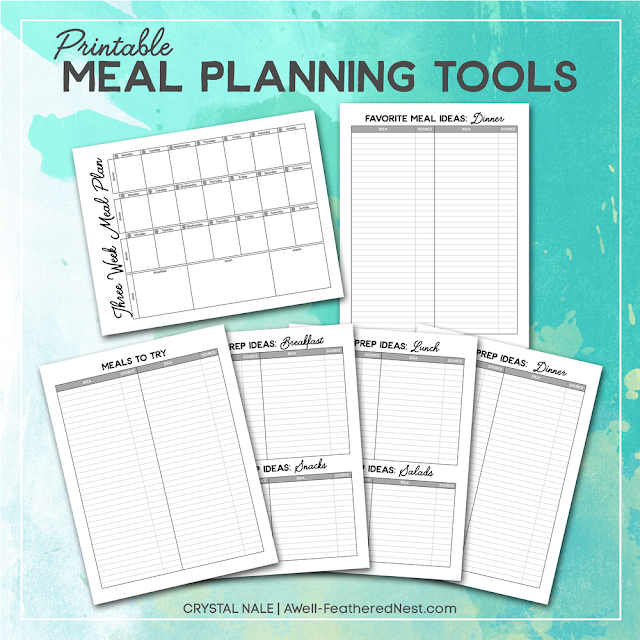 I've just finished turning all of my notebook scrawls and lists and charts into a printable set of meal planning tools to help me keep my ideas organized. It gives me a neat and clean place to keep all of my lists (Listers unite! ), so I can remember what works for our family and where I found any recipes I may need. This really makes the planning process go much more smoothly and quickly. Since it's nice to share with others, I wanted to give you access to download the pages as I share a little about what's been working for me. Simply click on the image below to download the PDF file. It contains a three week meal planning page that focuses on dinner plans with a little space for breakfast, lunch, and snack ideas. You'll also find pages for lists of dinners your family loves, recipes you'd like to try, and ideas for prepping meals in advance. My peal planning style has developed over the years as I've learned what keeps me going. I have a totally different planning style when it comes to breakfast and lunch than when it comes to dinner. I have found that having a limited supply of basic choices for meals during the day makes life run smoothly. However, I don't want any list to boss me around for dinner--even if it's one I made. I'm giving myself a little pep talk here as I buckle down to get back on track for weight loss. I know what works for me. It's just a matter of doing it. For breakfast, I like to throw something in my wonderful super duper skillet to saute along with some eggs. 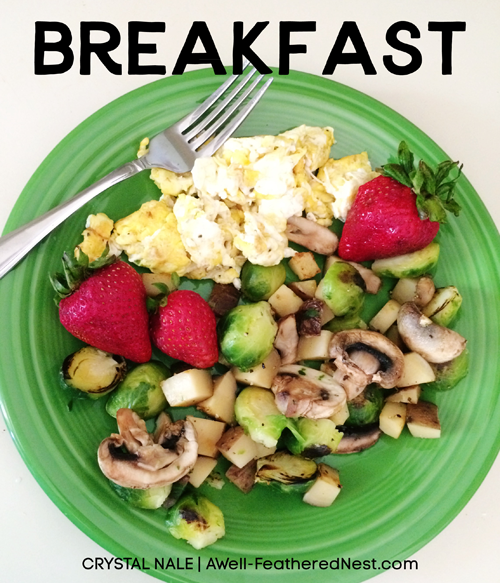 Although, I do have a few ideas for prepping breakfast on days when we leave the house or for my kiddos. I like to follow Whole 30/Clean Eating/Meal Prepping Instagrammers for inspiration for simple (but healthy) meals. They usually make it look so pretty...and yummy! I do like to full-on prep meals for my lunches in containers for the fridge or freezer. This works best for my because I never know what my day will look like, and I can grab and go on days that we have to leave the house without thinking too much about it. Prepping mason jar salads also works well for lunch. I usually just try to make a batch of a meal or two that I especially like (protein/good carb/veggie) when I can sneak it in and before my stash runs out. Sprinkle in some left overs here and there, and I've got a plan for lunch. For dinner, I've found that meal planning every two weeks using a three week planner works best for me. Sound crazy? I consider it vision-casting! I make out the plan for all of the days I know we'll be eating at home for the next three weeks, and I like to try to have all of the main ingredients on hand after I do that. This gives me the flexibility to switch things up as necessary (or according to my whims) while it frees me from the "What's for dinner?" moment each day. After two weeks, I look at what we've actually eaten and move any unused recipes to the next three week plan before adding more meals to it. The lists are super helpful because I find that my ideas tend to fall out of my head before I can use them with so much going on as a mom and wife. I also needed to be able to keep track of where I can find the recipes--Pinterest, blogs, on my hard drive, books, etc. The main way I use Pinterest these days is to collect recipes, but it's difficult to find things with all of the pins I've collected over the years. I've created two boards to help with this: Recipes to Try and Regular Recipes. I'll go through my recent pins and decide on a couple of recipes to try soon. These get re-pinned to my "to try" board. If it's a keeper, then it gets moved to "Regular Recipes." This makes Pinterest easier to navigate for me. My summer goals always include finding ways to get my systems cleaned-up, so things will run more smoothly when we jump back into our regular fall schedules. 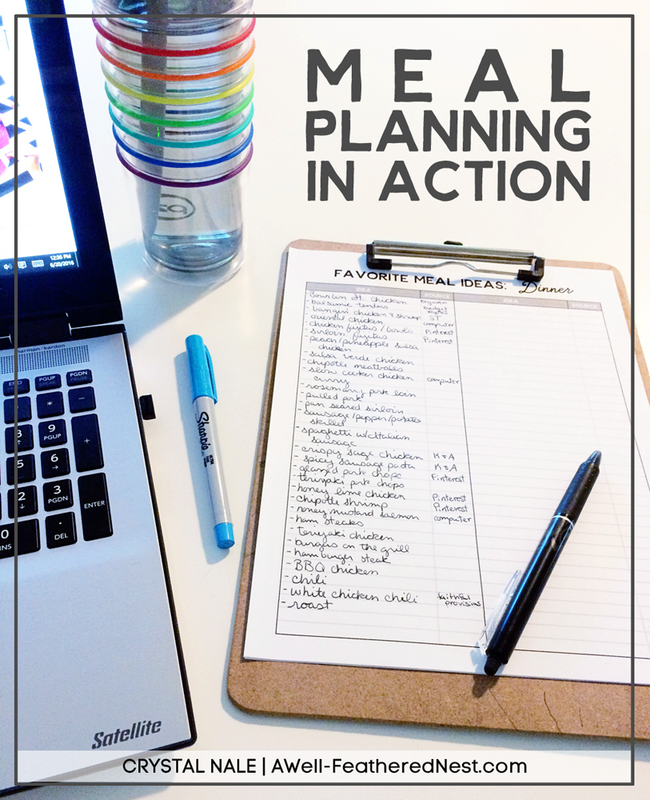 Getting all of my lists in order will help us eat healthier with less scrambling and help our budget out in the process! Anything that keeps my family out of the Zaxby's drive through is worth it. If these tools look helpful to you, then click here to download the PDF file. Did you miss me? Over the last year or so I have found myself entering a new season. It's a season that I know will be fleeting, and that has pushed blogging and associated tasks way down on my priority list. For some time now I've been uncomfortable being one more voice in the blogosphere to espouse advice of any kind. There's so much being said, and I'm no expert on anything. My kiddos are getting older, and I find myself needing to be with them in a different way. It's not so much about keeping everyone fed and safe anymore as it is about being present, offering balance, and really fostering relationship. I have a mere five years left with my oldest before we graduate him from our homeschool, and I've made the decision to change things up around here in order to give more of my time to our family in this season. My Etsy shop will stay open, but I won't be taking on any custom designs. This blog will primarily be a place for me to share links to things that I'm finding helpful or interesting from time to time and possibly to post about new items if I find myself adding to the shop. I blinked, and I'll have a teenager in a few short weeks. I know another blink or two will find our boys out in the world on their own. I want to savor the time we have left. Thanks for understanding. One place I have really had to learn to be intentional is in the kitchen. Having four people eating 3 meals from home every day really adds up quickly. 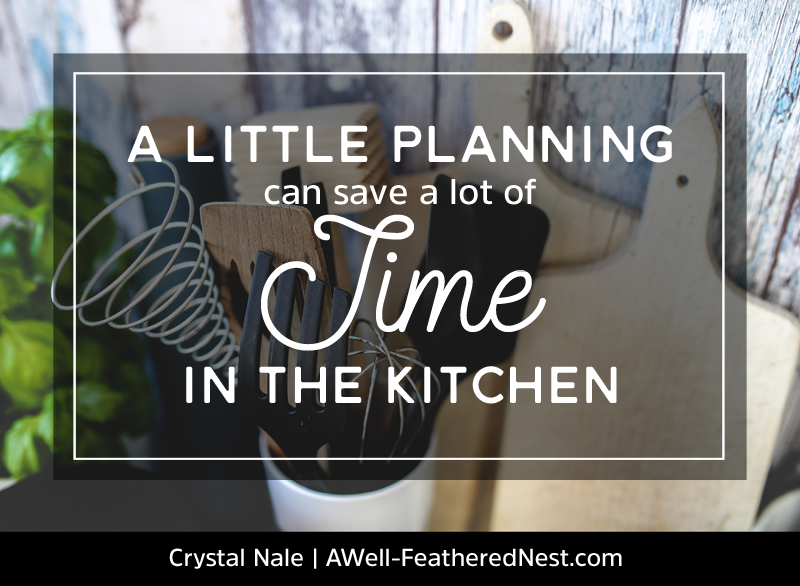 The time spent cooking and cleaning up can quickly be overwhelming, especially in the midst of all of our other everyday tasks. I've found that keeping a few things on hand in the freezer that can be used to whip up a quick meal with little cooking is extremely helpful on busy days. We all know there are tons of advantages to eating home-cooked meals as much as possible. Lately, I've been keeping my freezer stocked with cooked, shredded chicken that can be used in skillet meals, soups, chili, or even quesadillas or burritos. 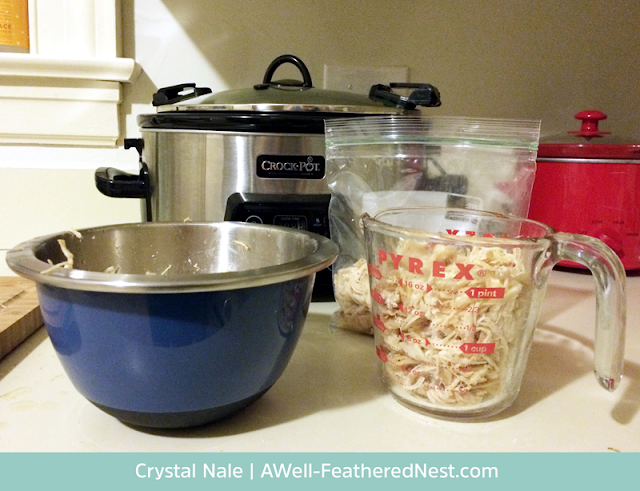 Using my crockpot means it takes hardly any time or effort, so it's easy to squeeze in during a busy week. I like to buy boneless, skinless chicken breasts at Aldi when they have them as the special buy of the week. I bought some for $1.49/lb. this week! Other great places to buy them inexpensively are from warehouse clubs (we only have Sam's Club) or Harris Teeter. If you have a Harris Teeter in your area, they always have chicken breasts in the fresh meat counter for $1.99/lb as an E-VIC special. I rub the seasoning on the chicken and place them in my crockpot to cook on low for around 8 hours. You could add a little olive oil to your rub if you'd like. You could also experiment with your own garlic and onion powders or even fresh to see how you like the flavor as well. I let the chicken cool a bit. Then I shred it with two forks, and I package it in approximately 2 cup portions. From my last batch I got 3 baggies to freeze, and I use one large breast for some white chicken chili that night. I'll often heat up a bunch of veggies or beans or something in a skillet and add the cooked chicken for a quick made-up recipe. Once you know what types of flavors your family likes, you can experiment with your own made-up skillet recipes. Do they like Asian flavors? Try zucchini and carrots with some soy or Teriyaki sauce. You can even add some cooked rice to the skillet. Do they like Tex-Mex flavors? Throw in some sauteed onions, a can of black beans, and a can of diced tomatoes or Rotel. Season it with some cumin and maybe even a little chipotle chili powder, and you have a yummy meal. My boys especially like this when I add some frozen corn near the end! I appreciate how having this pre-cooked chicken in the freezer saves me from the drive through, and my wallet does too! I've always love the way that a new year seems to hold so much possibility. With a little rest over the holidays, I can usually spend some time planning for new routines and setting goals. It feels great to go into a new year prepared and refreshed. 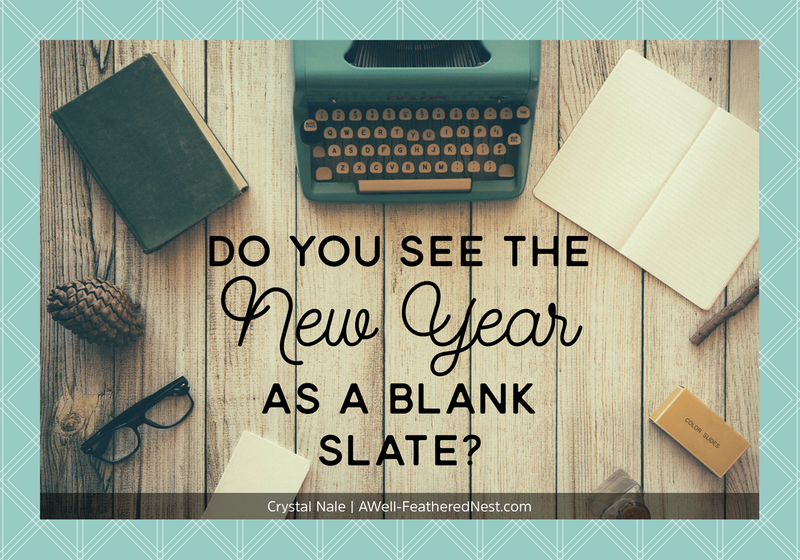 It's kind of like having a fresh beginning and a blank slate at the start of each new year. My hopes are raised with the countdown to midnight, but all too often it dwindles as we sink back into mundane days filled with never-ending chores and too little daylight. This year, for some reason, I've been especially prone to dreaming of a sunny beach. January has been a bit nutso at our house largely due to an unfortunate loss of all of my files from the last two years. Their loss was only made more bitter as I've kicked myself for not being more organized and on the ball with backing things up. It's been a real exercise in thinking positive thoughts, remembering who is ultimately in control of all things, and reminding myself that there really more important things in life than a bunch of files. It's also been nice to be distracted by getting myself more organized. I've been on a mission to use tech tools more in my organizational routines. In the past I've been mostly paralyzed by the thought of setting it all up--or even deciding how to set it all up. Look for a book review in the near future where I'll share what's working wonderfully for me right now. I'll never fully forsake pencil and paper, but it's nice to have a quick way to collect all my random thoughts and tasks in one place. 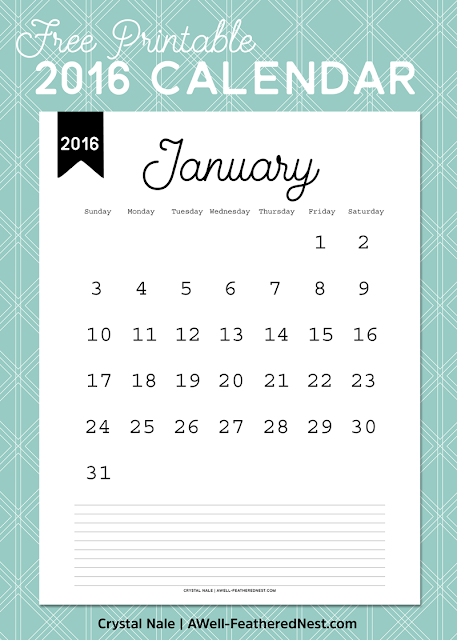 Would you like to join me in planning intentionally this year? With the new year before me, I always like to have a calendar to make my goals, hopes, and ideas a bit more visual. I whipped up a simple one that I wanted to share. I hope your new year has been off to a great start, and I look forward to sharing more printables with you all throughout 2016!